Moving is stressful and demanding. Thanks to the numerous phases and stages of the move, the job leaves you perplexed in every way. The skill and competence required for every phase is immense and therefore a DIY relocation should not be on cards. Laxity at any stage leads to breakage, delays and losses. Thus, relying on the services of professional movers Torbay to move to and from can make your move convenient and hassle-free. 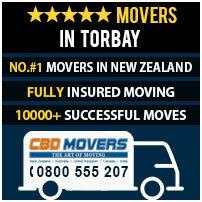 At CBD Movers NZ, we provide the finest moving services in Torbay at the most affordable rates. Staffed with trained and skillful staff, equipped with the latest and the best tools and trucks, we promise a safe and quick move. We excel in end-to-end moves and offer support and services that help you move and get settled in the safest and the fastest manner possible. At CBD Movers NZ, we undertake a wide range of removal services. We have been in business for over a decade and are aware of the nuances of the trade. We understand the varied requirements of clients and offer customized support that caters to house removal, office shifting and furniture relocation. We excel in packing and are trained in dismantling and reassembling furniture pieces. Besides comprehensive packing and shifting, we also take up basic loading and unloading jobs at the cheapest hourly rates. CBD Movers NZ is reckoned for it finest removal policies and processes. We own the best-in-line removal tools and techniques and are perfectly trained to use them in the most efficient manner. Our fleet of trucks is the biggest in the business. With trucks from a 3 tonne to 8 tonne capacity, we are capable of undertaking moves of every size. Each vehicle is equipped with climate control mechanism that further protects the move from damage caused due to exposure to temperature variations. We have a well-established network and are certified movers for local and interstate moves. At CBD Movers NZ, we strive to provide the lowest rates of every service we undertake. Without compromising on the skill and quality, we offer the finest services at the cheapest hourly rates. We do not charge a depot fee. Our comprehensive transit insurance cover is also reasonably priced for overall protection. We are transparent and clear in our operations and have no hidden charges. Our skilled professionals are available at an affordable rate of $30/hour per additional person. Torbay is a small suburb of Auckland, New Zealand. With beaches perfect for water sport activities, it is a desirable tourist spot. Torbay offers all the facilities and comforts like comfortable houses, productive office spaces, commercial centers, recreational areas and good educational institutes. It houses a population of nearly 5,000 people. 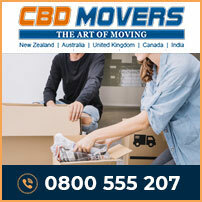 At CBD Movers NZ, we extend our support and services to take up relocation jobs for people moving to and from Torday in a hassle-free and convenient manner. Our moving services are safe and reliable. With the most affordable rates, we are the obvious choice amongst Torbay removalists. Get in touch with us to know more about our removal deals and affordable rates.